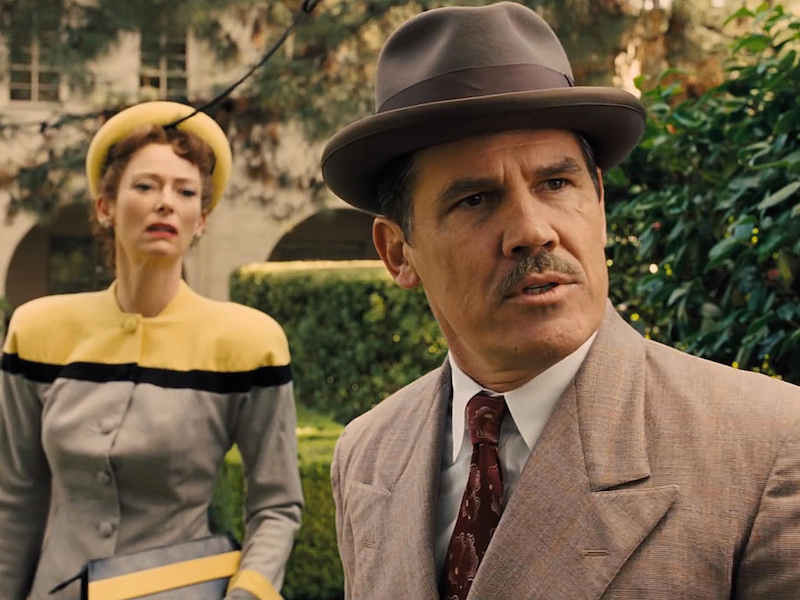 Tilda Swinton and Josh Brolin in Hail, Caesar! The Coen Brothers have proven throughout their illustrious careers that they can make just about any kind of movie that they want and with their new effort Hail, Caesar!, they return to one of their most cherished settings: the glamorous days of 1950s Hollywood. This was a time when massive movie studios could house dozens of individual productions on their lots, each with their own set of delicate demands and hangups with which to contend. Because of this potentially volatile environment, the studio system spawned top-level positions for “fixers”, who would not only oversee film production but also keep their high-profile actors out of trouble and especially out of the tabloids. Enter Eddie Mannix (Josh Brolin), whose title of “Head of Physical Production” at Capitol Pictures is basically a sophisticated way of saying that he’s the guy who runs in and out of movie sets all day trying to solve each problem that arises. Throughout his strenuous day, he deals with issues ranging from the pregnancy of unmarried actress DeeAnna Moran (Scarlett Johansson) to a Western movie star who is disastrously recast into a high-class period drama. However, his main task involves tracking down famed actor Baird Whitlock (George Clooney), who disappeared from the studio’s biggest production Hail, Caesar! and appears to have been kidnapped by a group who call themselves The Future. This may be the first time that I’ve felt that the Coen Brothers have potentially bitten off more than they could chew. This film is jam packed with potentially memorable characters, a number of whom only appear in one or two scenes, and promising setpieces that ultimately lack any greater meaning or relevancy to the story at hand. The marketing for Hail, Caesar! promises the same kind of manic zaniness of their 2008 comedy Burn After Reading but it’s not nearly as well paced or structured as that film, which has only gotten better with repeated viewings. Even though the day-in-the-life framework might suggest a tighter focus on Brolin’s character, the story instead seems to keep expanding further as it goes along. New characters continue to be introduced well past the one hour mark and sub-plots crop up like tangents in a conversation that was never terribly interesting to begin with. The political and religious allusions add a bemusing layer of subtext that may well reveal itself further upon deeper analysis but doesn’t add much to the story from a humor perspective. Despite the aimless direction, there is no denying that there are specific sequences that work tremendously. A scene between characters played by Ralph Fiennes and Alden Ehrenreich, the latter of whom is struggling with a particularly boorish line reading, is one of the funniest dialogue exchanges in the Coen catalog. The large-scale production numbers involving synchronized swimming and sailor-costumed tap dancing are first-rate throwbacks to the genre films of the era. This love letter to old Hollywood could have benefited from a re-write (or two) and a great deal of more concentration from these masterful directors.